Chapter XXIV. 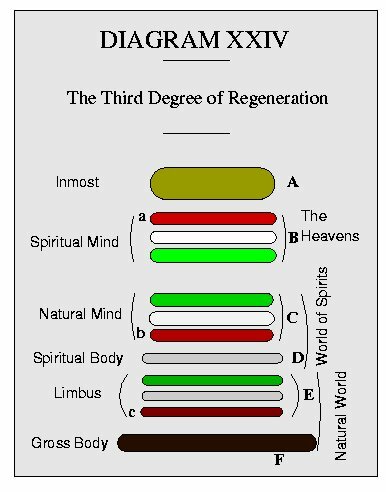 The Third Degree of Regeneration. The whole natural man (except the gross body to be rejected) is joined to the spiritual mind and ever after acts as one with it, the willing servant of a heavenly lord and master. Dying in this state man rises to an abode in the celestial heaven. From the above concord of the natural with the spiritual there is however this abatement, the vanquished but not exterminated evils from the father and any actual evils that may have existed, though dormant, still remain in the circumference of the spiritual-sensual and spiritual-corporeal. These evils by the force of the ever increasing good within are continually pressed out into the farthest verge of that plane, where (though dormant) they cannot but emit deleterious effluvia which must sink from the highlands where the angels reside down into the lowlands surrounding the hells. (AC 4564, 1414, 1444, 4551, 4552.) In the above abatement must be included the limbus so far as tinctured with actual evil therein enrooted or affected by the influence of unexterminated evil in the higher degrees. Previous: Chapter XXIII. The Second Degree of Regeneration. Up: Discrete Degrees Next: Chapter XXV. The Wicked. “The internal man with every one is of the LORD alone. There the LORD stores up goods and truths with which He gifts man from infancy. By these He flows into the interior or rational man and by this into the exterior [or natural man], thus it is given to man to think and to be a man.”-AC 1707. In this passage the internal man is the inmost A, the interior or rational man is B, the exterior is C D E F which together are called the natural or external man. (3.) Did not the LORD flow into this first degree He could not flow into the degrees below or even form them. Thus from conception this highest degree is filled with the Divine Love and Wisdom from which the LORD operates to form the faculties below and prepare them for the work to be accomplished after birth. “Love truly conjugial is derived from the love of the LORD toward the Church and from the love of good and truth which love is the love of the angels of the third heaven, wherefore love truly conjugial which thence descends as the love of that heaven, is innocence, which is the very esse of all the good in the heavens; hence embryos in the womb are in a state of peace, and infants after they are born are in a state of innocence. “-AE 985. “This celestial love flows in out of heaven with mothers while they carry in the womb as also with the embryos, hence exists the love of infants with mothers and innocence with infants.”-AE 710[a]. “By the womb is signified inmost conjugial love and thence celestial love in every complex…. The embryo in the womb derives more from the good of innocence than after it is born.”-AE 710[a]. These embryo states of innocence and peace being first in order are related to the following states as the seed is related to that which grows from it. Previous: Chapter XVIII. Man at Birth. Up: Discrete Degrees Next: Chapter XIX. Growth During Infancy.